The RecoBox from Lars Play is a revolutionary development in outdoor learning. It brings nature to your school’s doorstep no matter where you are located. Nature and the “World Around Us” are a very important aspect in children’s development, learning and understanding. It comes with its very own Habitat Wall already supplied with structures and materials to attract local insect and bird wildlife. The RecoBox is your opportunity to experience nature for the first time or indeed reconnect with nature. 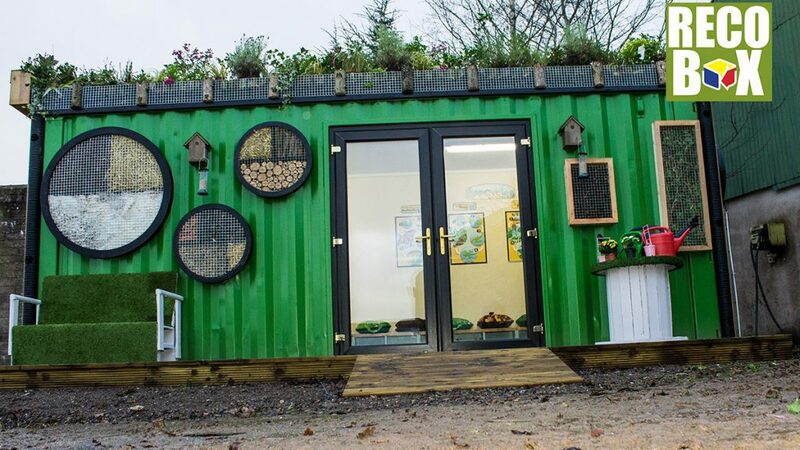 By using your RecoBox, you will be ‘connecting with nature’ through learning activities and at the same time helping to benefit both plant and animal wildlife in your local area. Many different types of materials can be used to attract wildlife to your RecoBox . Where possible, we use natural materials as these are less likely to cause harm to insects, bugs and other creepy crawlies that make them their homes. Some species of insect, such as butterflies, bumblebees and solitary bees, are sadly declining in numbers throughout the countryside. By providing a Habitat Wall you can contribute to the conservation of local wildlife and endangered species like butterflies, bees and hedgehogs. Another key feature of the RecoBox is its green roof covered with vegetation on a growing medium and a waterproofing membrane underneath to protect the roof. It may also include a root barrier layer and drainage and irrigation systems. With increasing building development, there are fewer habitats to support both plant and animal wildlife. Our Green Roof provide’s an essential habitat to support invertebrates (mostly insects) on which many birds depend for their food and which pollinate many fruits and vegetables on which humans depend for their food. A green roof also has advantages in its ability to temporarily store rainwater during a storm thus delaying it entering the drainage system and hence reducing potential flooding incidents. Another benefit of a green roof is in its ability to insulate a building from the sun’s heat in the summer and from heat loss during the winter. Other materials can be placed on the green roof to attract other species. For example, some dead-wood will provide a perch for birds and some sharp sand will attract burrowing insects such as beetles and solitary bees. Our habitat walls are carefully designed to attract many different species. Wood drilled logs this will attract solitary bees, bumblebees and butterflies. Female bees like to make a nest in logs. It will also attract woodlice, centipedes, wood-boring beetles, spiders, ants and hoverflies. Bricks and rocks will attract spiders, toads and frogs.